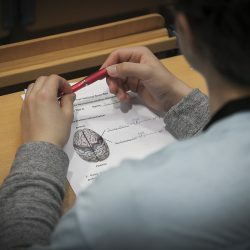 Format & Rules – Deutsche Neurowissenschaften-Olympiade e.V. The Deutsche Neurowissenschaften-Olympiade is a live question and answer competition event held in English. 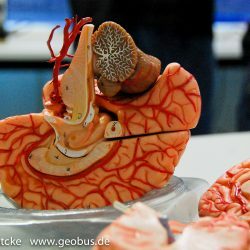 Each Neurowissenschaften-Olympiade consists of 5 sections. Students earn points during each of the first 4 sections to qualify for the final stage of the contest. The top 10 contestants will participate in the Final Podium Section. This is a short 10-question quiz with multiple-choice and short-answer questions, of which students will have 10 minutes to complete. In this first Podium section, each student will have the opportunity to answer three questions: least, moderately, and most difficult (5 points). Upon their turn, each student will approach the podium to answer a question, which is posed by a panel of three neuroscientist judges. For this section, students rotate through 40 stations, each containing a brain, a brain model, a microscope slide, or a photo. Students have 60 seconds at each station to answer each question. Students should be prepared to name the structures and the understand basic functions of each structure. Student are presented with 8 videos, each depicting a patient with one of the neurological diseases listed in the Study Guide. Students read the brief patient history, watch the 30-second video, then request results from two lab or imaging exams to help them diagnose each patient. This final podium section begins with the top ten finalists, according to the points accumulated during the previous sections. After all students answer a least difficult, and then a moderately difficult question, all further questions will be ranked “most difficult”. Contestants who triple-elimination, The last remaining contestant on stage after all others have missed three questions each is the German Brain Bee Champion! 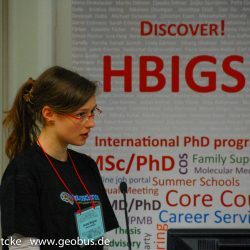 Each year the Deutsche Neurowissenschaften-Olympiade is organized as a series of competitions for young students, which takes place at 3 levels: regional competitions, a national finals competition for Germany, and finally the International Brain Bee competition. 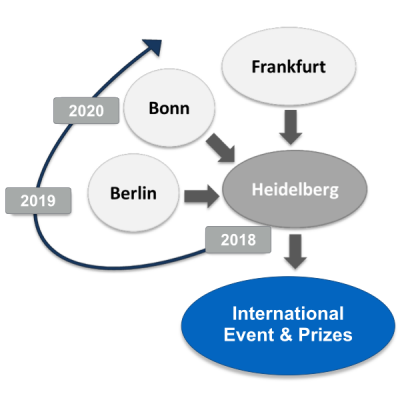 Regional competitions are organized by one of our local organizing teams in Berlin, Bonn, Heidelberg, and Frankfurt. The top winners of the regional competitions automatically receive a chance to participate in the nationals’ competition. In turn, the winner of the nationals competition has the opportunity to represent Germany at the International Brain be competition.